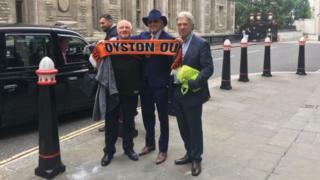 Image caption Owen Oyston posed outside court holding a protester's scarf bearing the words "Oyston Out"
Blackpool FC's majority owner denies seeking his own multimillion-pound payout after the club "struck the jackpot" to reach the Premier League. Owen Oyston is accused by club president Valeri Belokon of improperly extracting millions of pounds from the football club after 2010. The majority shareholder has told London's High Court he was the victim of a "set-up" by Mr Belokon. Mr Oyston and his son Karl deny "unfair prejudice" against shareholders. Karl Oyston is the club chairman. During the hearing earlier his father Owen Oyston was cross-examined about an £11m payment made to his service company Zabaxe Ltd in 2012. Andrew Green QC, appearing for Mr Belokon, told the court: "The reality is you wanted a multimillion payment out of Blackpool FC (BFC) now that the Premier League jackpot had been struck, and the BFC board was going to give it to you." Denying the claim, Mr Oyston said for many years Zabaxe had provided services to the club free of charge, including accountants, solicitors, architects, secretaries and other staff through the Oyston group of companies. Latvian Mr Belokon is acting through his company VB Football Assets, which is a minor shareholder in the club. Mr Oyston told the court he was being set up by the club president after the Latvian millionaire's attempts to increase his shares in the club failed. Mr Belokon purchased a 20% shareholding in 2006 but made the decision in 2011 to "exit the club and prepare for legal action" after he failed to acquire a 50% share in the club, following unfruitful attempts to approve other financial arrangements, Mr Oyston said. Mr Belokon then proposed in 2013 the board should "buy him out for an exorbitant £24.15m", the court heard. "The whole purpose was not to co-operate, but try to establish evidence to help him in a court case." "It was a set-up. They were setting up for this legal case which is why I am now here today," Mr Oyston added.